Summary: On June 4, 2017, series producer Eshiro and series director Takumi held a "Special Court Seminar" on Gyakuten Saiban (Ace Attorney) the Akihabara, Tokyo location of the Human Academy They discussed what how development on Dai Gyakuten Saiban 2 - Naruhodō Ryūnosuke no Kakugo (“The Grand Turnabout Trial 2 - The Resolve of Naruhodō Ryūnosuke”) is progressing as well as the overseas, localized releases of the series. The two also answered a few questions from the audience. This is a translation of part two of Inside's two-part report on the Special Court Seminar. A translation of the first part, which delves into the topic of how the first game, as well as the spin-off series Dai Gyakuten Saiban ("The Grand Turnabout Trial") were conceived, is available here. Images are taken from the source column. The graph below has been edited slightly to include English. Copyright belongs to their respective owners. Capcom’s Mr. Eshiro and Mr. Takumi have started their Gyakuten Saiban Special Court Seminars with the first lecture having been held on June 4 at the Akihabara, Tokyo location of the Human Academy. This is the second part of the report on the lecture. Readers who have not read the first part yet, are advised to read that article together with this one. In the first part of our report, we wrote about how Gyakuten Saiban (Ace Attorney) and Dai Gyakuten Saiban (“The Grand Turnabout Trial”) were born. The next topic is the long awaited Dai Gyakuten Saiban 2 (“The Grand Turnabout Trial 2”). Mr. Takumi explained that the development concepts this time were “All the mysteries will be revealed” and “easier to play”. Mr. Eshiro explained that the “Resolve” in the title also referred to the resolve of all the team members to make this a great game. Dai Gyakuten Saiban 2 has gone through several in-company versions, from demo version to alpha to beta, but even so, once many players get their hands on the game, they always find things that that the development staff has overlooked. With their hands on feedback like “This part was hard to understand” or “The pacing of the dialogue here was not good”, they are now working on brushing up the game. Ryūnosuke, the protagonist of Dai Gyakuten Saiban, often lets his eyes wander off. This was based on the idea that Sherlock Holmes was able to read a lot of information simply by looking at the eye-movements of his conversation partners. From this little bit of trivia, the lecture moved on to the animations of the characters, something many people talked about. Mr. Eshiro explained that ever since they started creating 3D-modeled characters, they also need to reserve a lot of time to finely adjust the animations. Mr. Takumi picked up after that and emphasized that "We took a good look at how the separate animations are connected and improved the pace for that in Dai Gyakuten Saiban 2, so the motions feel more natural now. We couldn’t cheap out on effort just because this was the sequel…. In fact, I think that the amount of work it took us perhaps even doubled." Meanwhile, Mr. Takumi took on the complete opposite position. “As the director, I’d be very happy if you would avoid the news coverage as much as possible and just play it in person, enjoying and getting surprised by it on your own terms. The director who needs to promote his game to clearly convey how wonderful it is, and the director who wants to the game he himself worked on speak for itself. Neither of them is wrong, but it’s here you see the differences between their jobs. 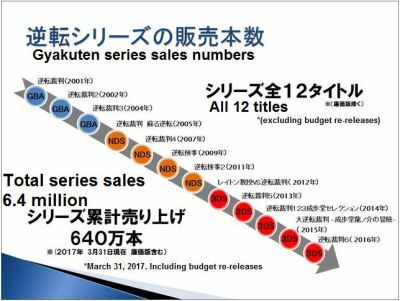 There have been twelve titles have been released in the Gyakuten Saiban series up until now, with total sales numbers of 6.4 million. Naturally, their focus isn’t only on Japan, but also on the overseas market. As it is a game with an extreme large amount of text, the translation process also takes a lot of time, but if there’s too much time between the Japanese release and the overseas release, information on the title will spread through the internet, so there’s also a necessity to keep the releases as close to each other as possible, and this present to be a problem at times. Mr. Eshiro explained. For this reason, it has been decided since Gyakuten Kenji (Ace Attorney Investigations) that they’d only localize to English anymore. Enthusiastic fans of the series might now that Naruhodo-kun is called Phoenix Wright in the overseas version, but the localization process includes more than that, as settings and the content itself are also sometimes changed drastically to make the game understandable. For example, the setting of the game has been changed from Japan to Los Angeles, and Mayoi’s (Maya)’s favorite food has been changed from miso rāmen to hamburgers. The reason for this is that overseas, rāmen is usually associated with cup noodles, and not as an accessible dish when eating out. A lot of effort is also poured into small details, like culture-localizing Japanese (language) jokes into something people from many countries will understand. Ms. Janet Hsu is the localization director who oversees the localization process. It is thanks to her that the Gyakuten series has an overseas fan community as lively as the one in Japan, with enthusiastic fans who cosplay as the characters. Overseas fans are also quite aware of Ms. Hsu’s exploits, and there are even people who ask her to sign something at events. Gyakuten Saiban is thus supported by its fans for a long time, and celebrated its 15th anniversary in 2016, which has led to all kinds of projects: it was adapted as a TV anime series, the spin-off series Gyakuten Kenji was made into a theater play, the 15th Anniversary Special Court event was held in the Maihama Amphitheater and the gallery Gyakuten Saiban Art Gallery was also opened. There was also an orchestral concert in May. Mr. Eshiro was positive about it, saying they were looking if they could do one again. After answering the questions from the audience, Mr. Eshiro finished the lecture with: “The development of Dai Gyakuten Saiban 2 is almost finished. In case you haven’t played the first game yet, we’ll also release Dai Gyakuten Saiban 1&2 Limited Edition - Naruhodō Ryūnosuke no Bōken to Kakugo- (“The Grand Turnabout Trial 1&2 Limited Edition - The Adventures and Resolve of Naruhodō Ryūnosuke”) , so please look forward to it.” With this, this lecture with all kinds of valuable stories was concluded. Afterwards the two started to sign books and CDs the visitors had brought with them and as long as time allowed them, the fans got to get talk with the two creators behind the Gyakuten series. Finally, here are above-mentioned questions from the audience. Q. How do you visualize things when you’re working on the scenario? Also, when does the complete visuals as they appear in the final product appear in your mind? A. Takumi: It usually happens during the final adjustment stages of development, or when I first see the animations. Sometimes I change the dialogue lines of characters once I’ve seen them moving. When I’m working on the plot and writing the scenario, the characters are just pieces on a chess board to me, so I don’t really visualize the scenes really. But they can’t remain chess pieces all the time of course, so I do consider their personalities when working on the scenario. Q. What is the most important to you when working on the Gyakuten Saiban series? A. Takumi: The story has to be a mystery story. That is my number one rule. As for the development process order, I’ll first think of the story, and then I’ll think of what kind of characters I’d need for my story… that is how I come up with characters. We have a lot of unique people working at Capcom, so I sometimes let them serve as a model when I create new characters. For example, the family name of Kamiya Kirio (Adrian Andrews) was taken from Kamiya, who entered Capcom the same year as I did (Note: Kamiya Hideki of Platinum Games). Just his name, mind you (laugh). Q. What scene were you most satisfied with seen as a developer? A. Takumi: Probably the climax scene of Gyakuten Saiban 3 (Ace Attorney 3 - Trials & Tribulations). Kamiya actually complained to me after the release of 2 that I had changed Naruhodo-kun’s theme song, so I thought some things are perhaps left unchanged, so I use his theme song from 1 for the climax scene of 3. Q. Did you have troubles inserting your own interpretation of Sherlock Holmes when making Dai Gyakuten Saiban? A. Takumi: I had always wanted to make a game with Holmes, so to be honest, not at all (laugh). The Holmes who appears in Dai Gyakuten Saiban, has always been within me. Q. What are some works you have enjoyed lately. A. Eshiro: As a producer, it’s my job to find out what is fun and what is not, so I consume a lot of fiction in my everyday life. I’ve been watching overseas drama lately, and I enjoy the medical mystery House, M.D. quite a lot. After the success of this seminar at Human Academy’s Akihabara and Ōsaka locations, it has been decided extra lectures will be held from July on in Sapporo, Sendai, Nagoya, Hiroshima, Fukuoka and Naha. Perhaps it might be interesting to go to listen to this valuable lecture?